15 ug of MeFS extract was loaded onto an SDS-Page gel and then transferred to Nitrocellulose membrane. The membrane was blocked with 5 % dried milk powder for 1 hour at room temperature, before being incubated with 0.5 ug/ml of anti-FAN1 (1-300 mouse) S778D for 1 hour at room temperature. 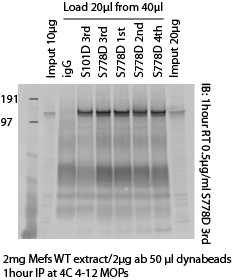 Membrane was washed in TBS-Tween buffer and then probed with the appropriate secondary antibody. Immunoprecipitation - 2 mg of Mefs extract was immunoprecipitation with 2 ug of anti-FAN1 antibody for 1 hour at 4 deg C, before being immunoblotted with anti-FAN1 S778D 0.5 ug/ml.